Canada is one of the most sought after destinations for immigrants. There are a number of reasons due to which people wish to migrate here. There is plenty of scopes to get good jobs and great career opportunities. The education here is really outstanding. The quality of life and weather is very good. Canada has a stable economy and great infrastructure. One of the best ways to migrate to Canada! If you are a skilled worker then you must opt for the Canada express entry programme. This is a point based programme. It is based on a number of factors. These factors include age, education, skills, work experience, language proficiency etc. The candidate must try and score more points. Better the points better the chances to get selected to apply for the visa. The 2018 immigration targets announced by the immigration authorities of Canada have given lots of hopes to aspirants. Canada aims to take around million immigrants by the year 2020. Canada recognizes the contribution that immigrants make in the economic development of Canada. The Federal budget declaration also gives a clear indication about the countries encouraging and positive attitude towards immigrants. The government has given a clear picture about how it plans to spend the money on different groups of immigration. There is equal distribution of funds between different target areas of immigration. Different types of supporting programmes have also been introduced by the government. Funds have been allotted to French and English training assistance, Immigrant women, aid of asylum seekers and Canada’s start up visa programme. A look at the first few draws of the year! The draw that took place in January 2018 invited more than 2500 aspirants to apply for the permanent resident visa. It must be noted that the comprehensive ranking system cut off score was one of the lowest for this draw. Canada has increased its target admissions in the Express entry economic migration category by over 3,200 as compared to last year. Overall you can say that Canada is adopting a lenient attitude in order to encourage more number of skilled workers to migrate to Canada. So, here is what one can expect in 2018! The low cut off scores, more number of invitations being send, increase in the number of immigrants that Canada is going to accept speaks a lot. It clearly indicates that Canada wants to have a liberal stand. They want more number of skilled and deserving people to move to Canada and work towards the economic development of Canada. So, in the coming few months candidates can expect a lot of encouraging response from the Canadian authorities. There are chances that the cut off of the CRS scores may further get reduced. This will help more number of people to get the invitation to apply for the permanent resident visa of Canada. 2018- The right time to apply for the permanent resident visa! 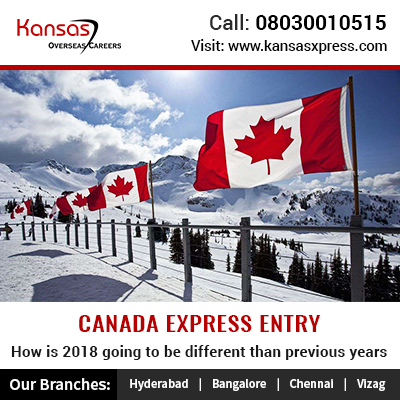 If you are keen to migrate to Canada then this is the best time to apply. More number of applications are being accepted and more number of people are being invited. So, if you have the right skills and credentials then you have better chances of getting selected this year. So, if you have been waiting for the right time to apply then it is right now! In order to apply for the permanent resident visa under the Express entry programme you need to follow a proper procedure. In order to get complete and correct details get in touch with a reputed immigration consultant. This way you will get correct information and the chances of rejection due to incomplete formalities will get reduced. Canada is welcoming the right immigrants with open arms through express entry process. The skilled workers who always wanted to migrate to Canada must take advantage of the liberal policies of the authorities and apply for the visa this year itself.